Back in April, DC Comics announced that legendary comic book artist Frank Miller is returning to close out his iconic series The Dark Knight Returns saga with The Dark Knight III: The Master Race. This comic will continue the story of Miller's 1986 classic The Dark Knight Returns, one of Time Magazine's 10 greatest graphic novels of all time, and its 2001-2002 follow-up series Batman: The Dark Knight Strikes Again. Today, DC Comics revealed that The Dark Knight III: The Master Race will be released on November 25, while debuting the first in a series of variant comic book covers. The Dark Knight III: The Master Race is heading to local comics retailers everywhere on November 25, and in addition to the fantastic array of retailer-specific variant covers available, DC Entertainment is revealing the first of several "standard" variant covers for the series! 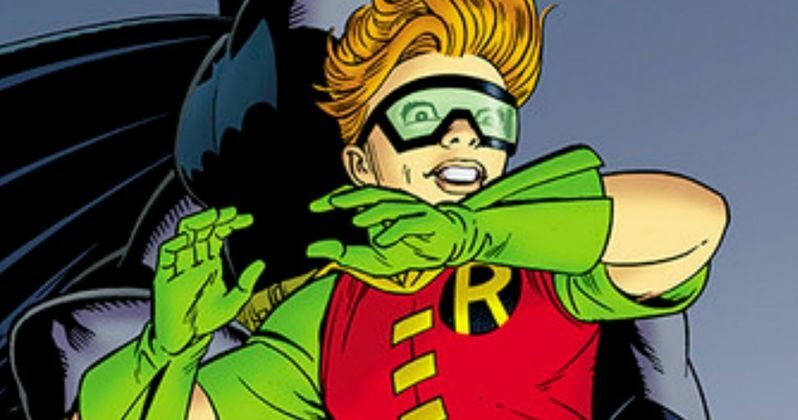 This 1 in 50 variant cover is rendered by Dave Gibbons of Watchmen fame, and features an iconic pose of both Batman and Robin (Carrie Kelly) bounding across the rooftops of Gotham City. Frank Miller will be joined by acclaimed writer Brian Azzarello (100 Bullets, Joker and Wonder Woman) on the eight-issue comic book periodical, to be published twice a month under the DC Comics imprint. The Dark Knight III: The Master Race will mark the 30th anniversary of the The Dark Knight Returns original series. With the books debuting in November, the series should end its run in March 2016, fittingly, just before Batman v Superman: Dawn of Justice hits theaters. Batman v Superman: Dawn of Justice has long been thought to be either adapted from or inspired by The Dark Knight Returns, but since very little plot details have been announced, we don't know for sure. When director Zack Snyder first announced the project at Comic-Con 2013, the filmmaker brought actor Harry Lennix onto the stage to read a passage from The Dark Knight Returns, before they displayed the official logo. Hopefully we'll get more concrete plot details between now and Batman v Superman: Dawn of Justice's release next March. Unfortunately, DC hasn't released any plot details for The Dark Knight III: The Master Race yet, but with its release just two months away, stay tuned for more information. We'll keep you updated about more variant comic book artwork as soon as they are announced, but in the meantime, take a look at Dave Gibbons artwork below. Are you looking forward to this new comic from Frank Miller?